Yes! The Golden State Warriors are world champions! I’m still nursing my celebration hangover from Game 6 of the NBA Finals. It was quite a story. There was all the hoopla about the the Splash Brothers vs. “the greatest player in the world.” With the exception of Warrior fans, the rest of the country was sure that King James would carry the day like Michael, Magic, and Larry did in the 1980s and 1990s. But he didn’t. And the Golden State Warriors are world champions! This was a topic of conversation when I had lunch with Hall of Fame basketball coach Percy Carr last week. Coach Carr just finished his 40th season at San Jose City College and has his fair share of championships. He mentioned a tidbit of history that I’m sure not many people know about. The last time the Warriors were world champs, the team’s practice facility was the gym at San Jose City College. The team practiced at SJCC from the mid-1960s through the end of the next decade. Hall of Famer and 1975 NBA Finals MVP Rick Barry played there, as did Warrior greats Al Attles, Clifford Ray, Jeff Mullins, Jamal Wilkes, Phil Smith, and Charles Johnson. 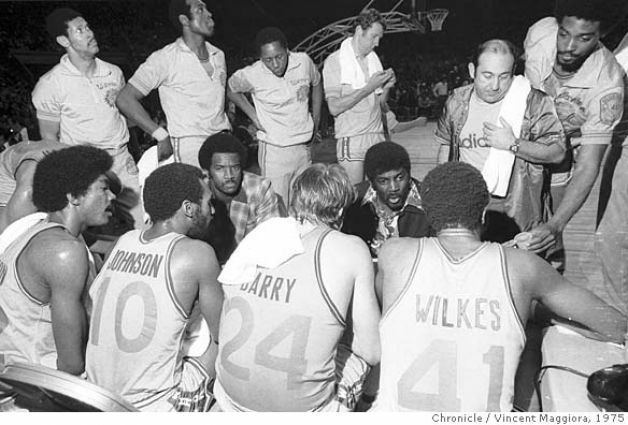 Attles was also the head coach of that 1975 championship squad. Coach Carr shared stories about the NBA stars playing pick-up hoops with the SJCC players during open gym. He recounted how the NBA players were right at home on his floor. They interacted with students and others who happened to hang around the court. Coach still has one of Clifford Ray’s size 19 high-top sneakers in his office as a souvenir from those days. I peppered Coach Carr with questions: When did the Warriors start practicing at SJCC? How did it happen? Why did the team choose to workout in San Jose, not Oakland or San Francisco? Since the the Warriors/SJCC relationship started before he arrived in 1976, Coach Carr didn’t have answers to my questions. I could see the light bulb illuminate above his head as he picked up his cell phone and dialed his old friend and “Mr. Warrior,” Al Attles. After a few minutes of friendly ribbing and chit chat, Coach Carr asked Coach Attles some of my questions before handing the phone to me. It was pretty cool for me to be able talk to the legendary Al Attles just a week after the Golden State Warriors won the NBA championship. Actually, it was VERY cool! Here’s what I learned: A generation ago, the NBA wasn’t the glitzy showbiz entertainment juggernaut it is today. That had its beginnings in the late 1970s with Dr. J’s acrobatic dunks and the Magic vs. Bird show. Then came Air Jordan, and the rest is history. The NBA evolved from a hard-nosed league of large men who happened to be the best basketball players in the world to today’s multi-billion dollar mega business featuring large men who are the best players on the planet. In 1962, the Warriors came to San Francisco from Philadelphia in when a group of local businessman pooled their money together to buy the team. When the Warriors arrived in San Francisco, there was only one other NBA team on the west coast, the Los Angeles Lakers came from Minnesota just two years earlier. The group bought the franchise for a whopping $850,000. Yeah, you read that correctly . A few years later, San Jose native Franklin Mieuli, who made his fortune in the local radio and television business , eventually bought out his partners and became principal owner of the franchise. As the NBA was getting a foothold in California during the early years, the Warriors were having a hard time finding a place to practice. The University of San Francisco was the only local college that was willing to give up some gym time for the pro team. That arrangement didn’t last long. The club then moved to the Oakland Mormon Temple where the old ABA Oakland Oaks practiced during its one year in existence. The Oaks failed to pay the rent, so the deal almost fell through because church leaders mistook the NBA for the ABA. That’s where owner Franklin Mieuli’s San Jose roots came in handy. He reached out to the SJCC administration and secured a long-term commitment to use the gym as the pro team’s official practice facility. Part of the deal included the construction of a professional-style locker room that the SJCC Jaguars still use today. Coach Attles told me that the SJCC community was always warm and welcoming. “We loved our time at San Jose City College,” he said. Today, the Warriors play regular season games at the Oakland Coliseum and work out in a state-of-the-art practice facility befitting a 21st century NBA franchise in that city’s downtown. The team is the best basketball club in the world. The best two players have a splashy nickname that resonates with fans in the high-energy entertainment industry the NBA is today. Steph Curry jerseys are the hottest items in the NBA’s retail business . In simpler times, the NBA champs hung out in a little gym in San Jose. Earlier this spring, I wrote that the SJCC men’s basketball team was the best kept secret in town (click here to read that article: https://esereport.com/2015/02/23/monday-meanderings-san-joses-best-kept-secret/). Now we know that the college has another wonderful secret. It is home to world champions.